F&W Media-David & Charles Books: Online Marketing For Your Craft Business. 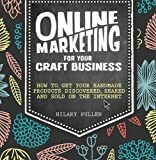 The Perfect Book For Learning How To Get Your Handmade Products Discovered, Shared And Sold On The Internet! This Book Contains A Highly Focused Guide For Using Social Media And Blogging To Measurably Impact The Sales And Brand Awareness Of Your Handmade Product. Author: Hilary Pullen. Softcover; 144 Pages. Published Year: 2014. Isbn 978-1-4463-0489-1. Imported. This entry was posted in Affiliate Maketing Products and tagged Business, Craft, discovered, handmade, Internet, Marketing, Online, Products, shared, sold by Planet Dev. Bookmark the permalink.